This post may contain referral/affiliate links. If you buy something, MSA may earn a commission. Read the full disclosure. Marvel Collector Corps is a subscription box that sends out exclusives toys and collectibles from Funko/Marvel. This box ships bi-monthly and always has a theme – and the featured theme is First Appearance Avengers! My Subscription Addiction paid for this box. (Check out the review process post to learn more about how we review boxes). The Products: Each box includes exclusive collectible product created by Marvel & Funko including apparel, collectibles, and accessories worth $50. Ships to: US and Worldwide (For international subscribers: Items over $20 in value will have duties/taxes that will range from 12% – 18% depending on the Province. There may also be a collection fee from the posted country). Check out all of my Marvel Collector Corps reviews to get more information on this subscription. Check out all of our Geeky Subscription Boxes in the Subscription Box List. Rate, review, and follow this subscription on the Marvel Collector Corps profile page. Good To Know: These are all exclusive items! Collector Corps is a bi-monthly subscription for Funko fanatics. Every delivery is themed in some way – some are themed after comic events/movies, like ‘Civil War‘, or a category of characters, like ‘Women of Power‘, as well as specific characters like ‘Ant-Man‘ and ‘Deadpool‘. This month has a fantastic old school vibe! You’ll get an information card that shows off every item. It also talks a lot about production details and choices made while curating this theme. Patch + Pin – Value $5-10? Every box opens up to an exclusive patch and pin set. This month features Cap, it plays off a lot of his early-appearance poses. The pin features Nick Fury from his first appearance in ‘Sgt. Fury and his Howling Commandos’ in 1963! The Incredible Hulk Shirt – Value $15? This month’s shirt features a POP version of Bruce Banner and the Hulk! They pulled this straight from the cover of The Incredible Hulk #1! it’s a fun way to tie in with first appearances. Iron Man (Tales of Suspense #39) POP – Value $20-25? This month didn’t pull the punches and sent two brand new POPs! The first features the very first look at Iron Man! I love that they added the cover of the issue on the back of the box. I have about 5-6 variations of Iron Man POPs, this one will fit perfectly with the entire crew. The second POP finally gives us Vision in the classic green and yellow! Once again, they include the cover of Avengers #57 on the back – a great touch! I also love the cape sculpt! Verdict: For me, two POPs is an automatic home run, pretty much all the time! I’d actually love for them to do more ‘First Appearance’ boxes like this – even a second one for Avnegers like Hawkeye! If you’re a POP fanatic, you simply have to subscribe to these to keep your collection up to date – and I have not regretted in yet. What did you think of the August 2017 First Appearance Avengers themed Collector Corps box? Eric is the co-founder of My Subscription Addiction. He’s been hooked on geek subscription boxes since 2012 thanks to Loot Crate and Nerd Block. Geek boxes sparked his desire for collecting Funko Pops and comic book statues! How do subscribers rate Marvel Collector Corps? Do you subscribe to Marvel Collector Corps? Add your rating now! I love everything in this box. Is there a mistake at the start of the review? It says the theme is Spiderman Homecoming…but that doesn’t seem to track. Sorry about that – sometimes I mess things up when I copy bits over. Updated. OMG that shirt is the sh*t!! Vote for Hawkeye as well!!! I desperately need more of his merc! I like the idea of the box, but I really only liked the shirt. The pops were both quickly made and not that original IMO. No one likes Vision and the iron man pop has been done before. I’ve worn it a few times but my 3 year old is so confused why hulk is grey. Comments may not appear immediately. More info here. Please do not enter your email address in the Name field or in the comment content! 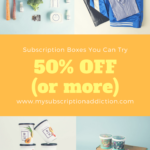 20 Subscription Boxes You Can Try for 50% Off or More! Allure Beauty Box May 2019 FULL Spoilers + Coupon! Boxycharm Limited Edition Skincare Box Spoiler #2! Marvel Collector Corps Box – March 2019 FULL Spoilers! "Is what’s included the confidence in a cream (shown in photos) or confidence in an eye cream (listed below photos)?" BoxyCharm New Subscriber Boxes Available Now + FULL SPOILERS! "Oh and I see spoilers, dr babor ampoules and viktor and Rolf so excited:)"
GlossyBox Coupon – FREE Water Bottle With Subscription! "I really don't care about the gummies, and I was ready to jump on this deal, but.....I was going to cancel my ol..."
Birchbox Coupon – Free Limited Edition Box A Toast to the Host Box with Annual Subscription!